Hike Messenger has unveiled a redesigned app with the launch of its latest version Hike 5.0. The latest version of the app gets UPI-based payments with the Hike Wallet feature. This new Wallet feature in Hike 5.0 will be rolled out for users by Sunday and few users have received the update by now. Detailing more, the Hike Wallet feature will be rolled out in Android first and then for iOS users. The company says that Hike 5.0 introduces brand new colors and fonts. Besides that, it also comes with many other features. The stories have been disappeared, and old timeline feature has got back. Users can set their moods as profile photos and post photos, text, and videos on their timeline which stay forever. Now, Hike Wallet users can make bank transfers instantly by making use of UPI. Money transfers can be made within the wallet for the users who does not have a bank account. The company has partnered with YES Bank for its banking activities. The company believes that the Hike Wallet will boost the UPI adoption in the country. 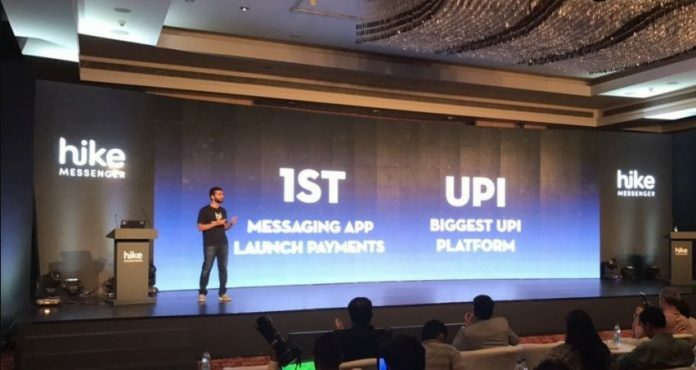 “With more than 100 million registered users currently on Hike Messenger, this launch makes Hike the largest UPI-based platform in India overnight,” says Hike in a statement. “Over the last 6 months, we’ve been working to bring a brand new experience to our users with one question in mind – How do we take all the things that users love about Hike and make it even better? Hike 5.0 is our most ambitious step in that direction till date,” says, Hike Messenger founder and CEO Kavin Bharti Mittal at the launch event.